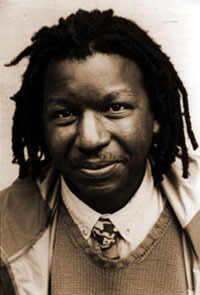 Cornelius Eady's most recent collection of poetry, Brutal Imagination (G. P. Putnam's Sons, 2001) was a finalist for the 2001 National Book Award in Poetry. He is also the author of Kartunes (Warthog Press, 1980); Victims of the Latest Dance Craze (Ommation Press, 1986, winner of the 1985 Lamont Prize of the Academy of American Poets); BOOM, BOOM, BOOM: A Chapbook (1988); The Gathering of My Name (Carnegie Mellon, 1991), a nominee for the 1992 Pulitzer Prize in Poetry; You Don't Miss Your Water (Henry Holt, 1995); and the autobiography of a jukebox (Carnegie Mellon, 1997). His many honors include the Strousse Award from Prairie Schooner, a Lila Wallace-Reader's Digest Award, and individual Fellowships from the Rockefeller Foundation, the John Simon Guggenheim Memorial Foundation, and the National Endowment for the Arts. He has recently collaborated with jazz composer Deidre Murray in the production of several works of musical theater, including You Don't Miss Your Water, Running Man, Fangs, and Brutal Imagination. In 1996, Eady and fellow poet Toi Derricote founded Cave Canem, a nonprofit organization for black poets. Formerly the director of the Poetry Center at the State University of New York at Stonybrook, Eady is currently visiting professor in creative writing at the City College of New York.